UPDATE…. my Southern Colcannon and “Cabbards” recipes were published in Our State Magazine in March 2015! This is such a tasty recipe to serve anytime, but just right for adding a southern twist to your St. Patrick’s Day supper table. I am republishing this old fave per requests… I hope you’ll enjoy! With all the blogs and newsletters filling my inbox with St. Patty’s Day recipes, I got to pondering what I could do to put the “Wendy Twist” on things while throwing some Irish South In Your Mouth. So far as I know, there’s nary a drop of Irish in me, but green IS my favorite color. Those are (that is) my credential(s) for this recipe. All my life, I’ve seen “colcannon” but never really paid attention to what that is, so being the Culinary Adventurist that I am, it was time for me to dig deeper… turns out, “DIGging” around was appropriate since this dish involved taters that have been dug up… somewhere… sometime. I first turned to a few dictionaries to find out just what such an oddly named dish is made of… and find that to be potatoes, greens (traditionally kale, but cabbage and other greens have come to be used), butter and seasoning. Bestill me heart, you little Leprechan! Some of my FAVs… this is a no-brainer for me. Since I love to sub this for that, and that for the other, I got to it. Next.. cabbage. I do luv me some cabbage, but even mo’ better are my cabbards. We’ve cooked those here before… and just so happens I still have plenty of my winter stash in the freezer, so just had to thaw and heat those. Ahhh… Butter! A staple in my kitchen. Not much that makes butter better… except browning! I’ve been throwing browned butter into all sorts of stuff lately, so why not atop my Southern Colcannon too? And according to the song I found, see below (after creating my recipe), it seems there is supposed to be a butter hole on top! So there’s your pot ‘o gold. Toasty, nutty browned butter. I’m quite certain the fountains in heaven doth flow with luscious browned butter. As I read more about Colcannon, it seems that it is mostly served with ham. Yet another staple in my kitchen, it only makes sense to this “Irish for a day gal” that a helping ‘o country ham (from here in North Carolina of course) snuggles up next to my concoction of Southern Colcannon! Now that, my friends, is my contribution to the day of Irish celebration. Colcannon is so groovy, it has its own song. So here you go… tap along. The song “Colcannon”, also called “The Skillet Pot”, is a traditional Irish song that has been recorded by many artists. “Yes you did, so you did, so did he and so did I. The story of its name and the colcannon traditionalists versus “the other group” is rather interesting. I’ll let you decide if you need to know more… over here! And on a personal “toot my horn” note, St. Patty’s Day is special for me… because it was on that day in 2005 I QUIT SMOKING! If you have a Colcannon story or memory to share, please do in the comment box. Share your recipe too… for Colcannon or how you quit smoking. 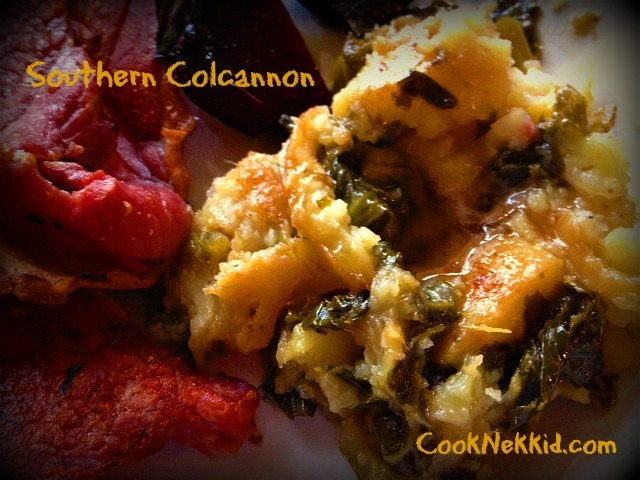 Southern Colcannon… get’n my Irish on for a day! Use about equal parts baked sweet potatoes and greens. Exactness is not important. Throw baked potatoes into mixing bowl and mash. Fold in greens and mix well. If using, add scallion into mixture and stir to combine. Or, simply add into greens when cooking or heating. Season with salt and pepper. Make well in serving of colcannon and fill with browned butter. UPDATE…. my Colcannon and “Cabbards” recipes were published in Our State Magazine in March 2015! This is such a tasty recipe to serve anytime, but just right for adding a southern twist to your St. Patrick’s Day supper table.